For the life of me, I cannot figure out how David Borden and his Mother Mallard's Portable Masterpiece Company did not register a bleep on my radar screen when I fell in love with the "minimalism" music scene in the eighties. It was back when the film Koyaanisqasti premiered at Philadelphia's Theater of the Living Arts that my eyes were pried wide-open by Godfrey Reggio's production of an astonishing symphony -- using the powerful combination of image (Ron Fricke) and sound (Philip Glass). I found myself living this film for quite a period after. A tape of the film's searing score would blast from my car, with its windows down, so others could hear the world they lived in. 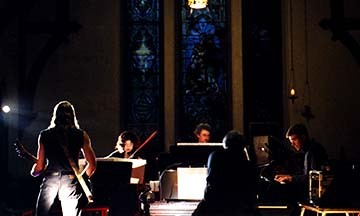 I would attend several Philip Glass Ensemble live performances, including a University of Pennsylvania premiere of "Koyaanisqasti Live"; which included the film with its score performed live by the Glass ensemble. I also attended a Steve Reich concert at the Annenberg Center, located on the same campus. 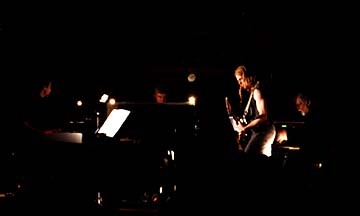 The likes of John Adams and Terry Riley became the way-of-life of my soundworld. So how did David Borden's innovations pass me by? Seems I'm not the only one who missed Mother Mallard's boat. 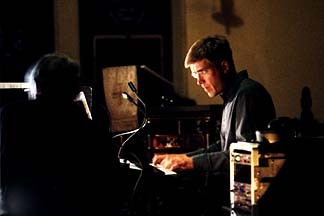 To quote the Gathering Signal, an informative pamphlet handed out at each St. Mary's event, "MMPMC's music is a unique blend of space electronics, minimalism, and contemporary classical and exhibits a uniquely American slant on synthesizer music by a band whose pioneering contributions to the genre have been largely overlooked by the mainstream." Well, consider me "onboard" now. Tonight's performance by the trio and its two guest performers was nothing short of scintillating. Right from the opening note, the high-volume Gathering crowd was in for a trance-forming journey. 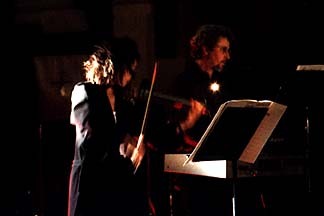 The trio of synthesists in the band consists of Borden, Blaise Bryski and David Yearsley. I can't fathom the amount of mental discipline required to maintain the precision and concentration in performing this style of music; with its combination of repetitiveness and subtle changes, and then the sudden-shifting (and, for the listener, gasp-producing) progressions, but the trio interacted and performed flawlessly. With each concert I attend, I subconsciously long for total mental and physical captivation by the music. This would occur during this evening's very first piece. 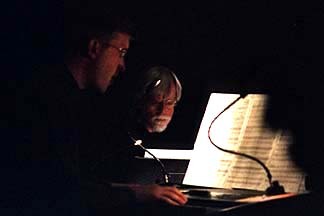 Actually, four of the six pieces performed tonight were, as Borden said, "The same basic piece under different guises." It was during the opening "guise" -- "The Continuing Story of Counterpoint, Part 1" -- when I had no choice but to surrender. My switch flicked; not only was I hearing the music, but I had been seduced by it. My entire sense-of-being had transformed to the sound I was lost in. The effect of minimalism done well is, to say the least, quite hypnotic. Two relatively brief sets were staged. 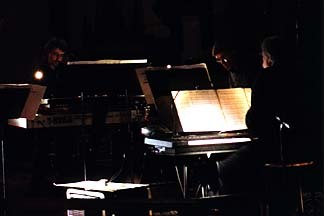 The first consisted of the trio playing three "parts" of "The Continuing Story of Counterpoint" and, after a brief intermission, two guest performers would join the trio for three more pieces. 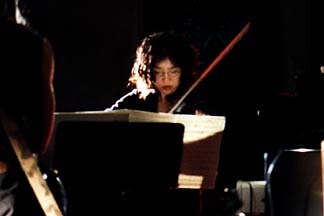 Ristu Katsumata, a beautiful and accomplished electric violinist, contributed to the second set's opening piece, which used a 14th century Mozart quartet as its basis. 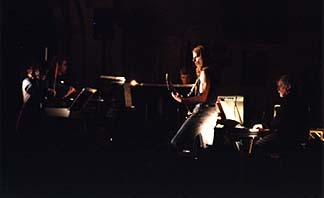 The second piece incorporated David Borden's son, Gabriel, on electric guitar. We were told that some Beethoven was mixed into this material, which, to this listener, came across as something like a progressive rock piece from the seventies -- visions here of a "Yes"-like epic with Rick Wakeman and Steve Howe holding court. All five performers would be onstage for the highly-climatic final piece, another working of "The Continuing Story of Counterpoint." Tonight's concert would leave the Gathering crowd longing for more. During the evening's intermission, I found myself near promoter/host Chuck van Zyl and felt compelled to thank him for what had already turned out to be an overwhelmingly wonderful night. Chuck, too, seemed elated at just how well the just-completed opening set had went. And we were only halfway home. Yet sadly, the night would end too soon; as would the spring Gathering season. Leaving the City, she was shrouded with mist; flashes of heat lightning, far, far away. Parting thoughts of the wonderful community, *our* wonderful community. Michael Stearns chimes away, over the distant horizon. We will be back. Well said! It was an excellent evening of astral travelling. I am listening, on the morning after, to the "1970-1973" disc, a re-release of their earliest recorded work. My interest in electronic music goes back to the early 70's. How did I miss this boat? The piece I judge all other attempts at minimalist music is Steve Reich's "Music for 18 Musicians" which affects me as you've described: It alters my consciousness as the piece shimmers and moves from place to place, while paradoxicaly remaining very very still. I remember it used to drive friends and significant others crazy, but I was always taken with Steve Reich, John Adams, Terry Riley, and to a lesser extent Phillip Glass (though yes, Koyaanisqatsi is great - I saw the Penn performance also, and hope to experience it again in September at the Whittaker Center in Harrisburg). Something about the (apparent) simplicity of the minimalist sound just worked for me: it always put me in that zone we space music fans love to visit. I could totally relate to your feelings pre-Gathering, hoping that tonight's guest would get you there. Mother Mallard defintely did. WaveWorld did. Robert Rich amazed me with his abilities to process and move the sound about in real time. One thing I always worry about when I attend a Gathering: can these guys pull it off live? So much of my early listening was in the form of LPs and later CDs. In the studio you have absolute control over you sound, over it's placement in space and time, over how you layer it and it's acoustic properties. In a live concert situation it's different. I enjoyed Vir Unis and James Johnson live for instance, but I like the recorded stuff on Perimeter II even better. Not that they weren't great improvisors and live performers, I guess I just enjoy the addtional "sheen" you can imbue a studio recording with.